Maryborough is a rural city 140 km north-west of Melbourne, situated towards the west of the rich Victorian goldfields region that includes Ballarat, Castlemaine and Bendigo. Maryborough is on the Pyrenees Highway and is the intersection of railway lines from Castlemaine to Avoca and from Ballarat to Inglewood. None is a main or trunk transport corridor. Maryborough was founded on a gold field and has agricultural land of average quality. Prior to the discovery of gold the Maryborough region was the Charlotte Plains pastoral run taken up by the Simson brothers. In March 1853, gold was found at Maryborough resulting in a rush. The alluvial finds were rich and a 40 pound nugget found in July 1853 caused no slackening of population. Known as Daly’s Flat for a short time, Assistant Gold Commissioner, James Daly named it Maryborough, after his Irish birthplace. It is estimated that the Maryborough district had 25,000 people by September 1854. The Maryborough advertiser began publication in 1854, and continues. The town was surveyed in 1855, and allotments sold in October of that year. The Maryborough borough was proclaimed on 31 March 1857. By then there were a school, Catholic and Wesleyan churches. In 1865 Maryborough was an established mining town. Anglicans, Presbyterians and Congregationalists had established church buildings, the entire district had mining operations, the town had a hospital, a court, a mechanics’ institute and numerous hotels. Agriculture was undeveloped because of scarce summer water, but the Goldfields reservoir was built in 1862. The railways opened lines in four directions from Maryborough in 1874-75, and the large and well appointed railway station was completed in 1892. Several civic facilities were completed: the post office and sub-treasury buildings were constructed adjacent to the town square (McLandress Square) in 1878 and the botanical (Phillips) gardens were laid out by 1879. Much more rapid growth occurred in the 1880s, with a Waterworks Trust, a school of mines (1889), new town hall (1887), a gas works (1882), a flour mill (1881-1980), a carriage works, a foundry and a jam and preserving factory. The four local brickworks could scarcely supply enough building bricks at one stage. Maryborough achieved an unusual diversity of industry for a medium size town, and continued to do so for the next 80 years. The court house (1893) completed the buildings at the town square. When gold mining ended an active progress association was formed in 1917. Its aim was industrialisation. A co-operative butter factory was opened in 1917, the Cuttle knitting mill was persuaded to move from Clunes to Maryborough in 1923 and the Patience and Nicholson tool works moved from Caulfield to Maryborough east in 1924-25. The Maryborough knitting mill, formerly Cuttles, was also the source of town electricity before supply came from Yallourn, Gippsland. By the end of the 1920s there were also a bacon factory, a plaster works, and a new picture theatre. The high school (1912) and technical school (former school of mines) consolidated their presence. 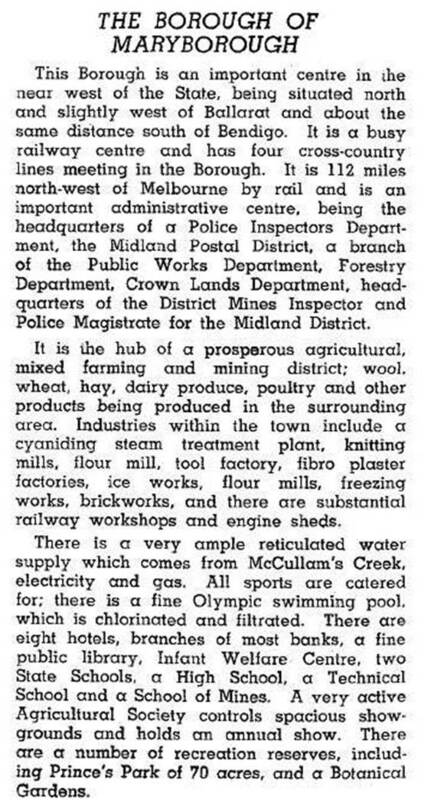 Throughout the 1950s and 1960s Maryborough continued to seek new industries. It was proclaimed a city on 31 March 1961. By the end of the 1960s it had 56 factories employing 1400 people. With the downturn in manufacturing industry, Maryborough has diversified into tourism. The railway station contains the Central GoldfieldsTourist Complex and an antique emporium. There are an annual Highland Gathering (first held 1857) and a Golden Wattle Festival. The knitting mill became part of Jockey Australia, Boral acquired Patience and Nicholson and Hedges and Bell, a locally formed printer (1948), is part of the McPherson Printing Group. Capilano Honey is also in Maryborough. In 2014 the Maryborough Education Centre had 1057 pupils. On 19 January 1995, Maryborough city was united with most of Talbot and Clunes, Bet Bet and Tullaroop shires to form Central Goldfields shire.